Spring has finally arrived and the promise of everything coming alive permeates the air. It's by far my favorite time of the year. It stirs up new enthusiasm for living, for outdoor activity and, yes, maybe even organizing your home or rearranging furniture or doing some deep cleaning. Change for the bedroom too is certainly appropriate for this time of the year. Floral garden party bedspreads in a soft tone or a traditional style quilt set will usher spring into your bedroom, and light or bright colors can reflect the spring mood as well. A lightweight comforter can be exchanged for the thick down comforter we used in the winter season. A thinner coverlet can be exchanged for the winter season thicker quilt. 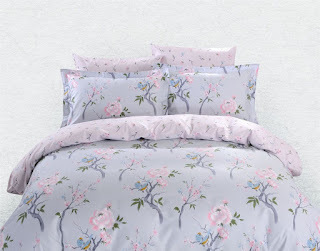 New bright spring colored sheets and pillow cases are a delightful way to liven up your bedroom for spring. Whether you prefer a cottage style quilt or a traditional quilt, lighter colors and a new spring look will change out your bedroom from the deeper and warmer winter colors. A light spring plaid duvet is an easy and affordable way to redecorate your bedroom. If you prefer an all season comforter inside the duvet, keep the comforter to use all year round and simply change out the seasons in the duvet from the winter colors and textures and invite in the spring. Open up the shades, let the sun shine in. Take a deep breath. Spring is here! So freshen up the atmosphere in your bedroom and bring in a sense of well-being for yourself. It can help create that peaceful tone to your sleep experience resulting in a deeper, more relaxed and restful night's sleep.